This marks the end of our first week on the Daniel Fast. I’ve had to be more creative, foodwise (marinated tofu, anyone? ), but I’ve found a few recipes that are keepers. The white bean soup is a super-easy recipe I’ve liked for a while, but this week was the first time I’d ever made flatbread. The herbed oil that’s brushed on top definitely helps the flavor (although I’ve made it plain and eaten it with peanut butter and cherry-apple butter too, which is also good). 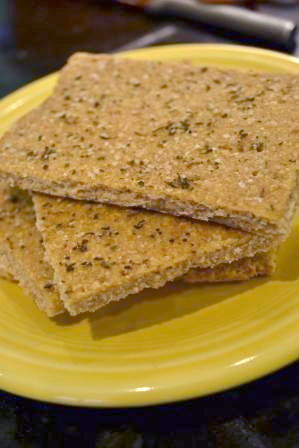 If you’re feeling really creative, this same flatbread recipe could be used to make pita-like “pocket bread”. Roll it out thin (1/8″), then fold the dough over on itself, cut into 4″ squares, and gently press the dough together, being sure to seal the edges. Once it bakes up it’s pretty easy to split open. Rosemary, oregano, or any other herbs you like. Heat oil in medium saucepan. Add garlic, carrots, and celery, cooking until the carrots begin to soften up a bit. Addbeans, vegetable stock, herbs and tomatoes and bring to a boil. Simmer over medium heat for 45-60 minutes or until vegetables are tender. 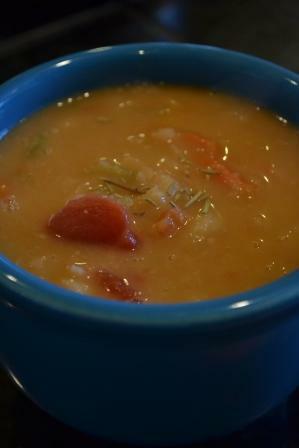 Remove about 1/3 of the soup and run through a food processor – the blended beans give the soup a nice texture. Smashing the soup with a potato masher works just as well. Add salt and pepper as needed, and serve with a little drizzle of olive oil. Mix all ingredients together, stirring until it forms a sticky ball. Turn out onto a lightly floured surface and knead for 5 minutes – at first the dough won’t want to hold together but the longer you work it the more doughy and elastic it becomes. Cover with plastic wrap and let rest for 30-60 minutes. Lightly flour your worksurface and roll the dough out to 1/4″ thick. Transfer to an oiled/lined baking sheet. Prick the top with a fork and brush with the herb oil. Bake at 400* for ~25 minutes, until light brown. Mix together and brush over flatbread dough before baking. Tags: baking, Daniel Fast, gluten free, recipe, soup, vegan, vegetarian. Bookmark the permalink. That flatbread sounds fantastic and simple. Great combo. Both recipes look wonderful.